90 new charge spots powered by low-carbon electricity will refuel 200 Renault-Nissan EVs during the COP21 climate change conference. 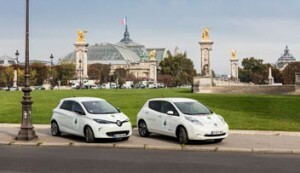 The Renault-Nissan Alliance is installing 90 new charge spots for electric vehicles in and around Paris for the COP21 global summit on climate change. The installation is being done in partnership with French energy provider EDF, Schneider Electric, Aéroports de Paris, Paris City Council and SNCF, France’s national railway company. The charging stations, several of which will be donated by Schneider Electric, will refuel 200 EVs serving as VIP shuttles for negotiators, delegates and media attending the conference. More than 20,000 U.N. participants from 195 countries are expected to attend the 21st annual Conference of Parties (known as COP21), from Nov. 30 to Dec. 11. “COP21 is a call to action to reduce the impact of climate change–including global warming resulting from personal transportation,” said Renault-Nissan Chairman and CEO Carlos Ghosn. “Electric vehicles are the only existing, practical and affordable transportation solution to our planet’s environmental challenges – and they are available today. Expanding the EV infrastructure is mandatory for any city or state that’s serious about environmental stewardship.” The quick and standard EV charging stations will use renewable and extremely low-carbon electricity from EDF, enabling the Renault-Nissan fleet to cover more than 400,000 km in two weeks. The quick charging stations will recharge EVs from 0 to 80% capacity in about 30 minutes. EVs consume any form of electricity used in the power grid, including hydropower, solar and wind energy. As countries reduce dependence on fossil fuels and increase reliance on renewable resources, EVs become even greener. Small carbon footprint The COP21 charging stations in the Paris region will use electricity with a small carbon footprint. The French power grid distributes electricity with a very low average of CO2 emissions per kWh: less than 40 g in 2014, compared to the European average of 325 g of CO2 emissions per kWh. Renewable energy accounted for about 19% of France’s electricity last year. 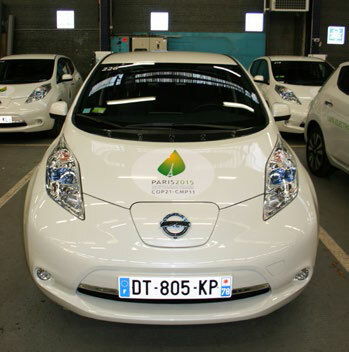 “EDF supports the development of electric mobility, which is a cornerstone of countries’ efforts to minimize urban pollution. EDF produces extremely low-carbon electricity in France, which enables a significant reduction in greenhouse gas emissions and thus reinforces the favorable ecological footprint of this new generation of transport,” said EDF Chairman and CEO Jean-Bernard Levy. In addition, EDF is offsetting the remaining CO2 emissions through carbon credits generated by projects certified by the United Nations. That means the Renault-Nissan EV fleet will use electricity considered fully “decarbonized.” Fourteen of the 27 quick chargers installed will remain after the climate change conference and will be available for the public to use. These include two at Charles de Gaulle Airport, two on the Paris périphérique highway and one at Orly Airport. France already has about 10,000 quick and standard charging spots. 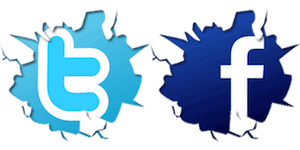 In the Paris region alone, there are more than 4,000 spots, making Paris one of the most “plugged in” cities in Europe.